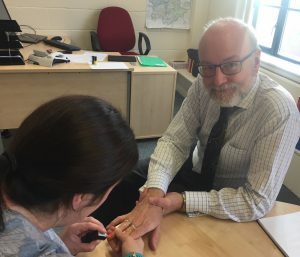 Stockton North MP, Alex Cunningham, is supporting anti-slavery charity Unseen’s ‘Let’s Nail It’ campaign, joining celebrities, businesses and community groups across the country who have painted their nails to raise awareness of slavery in nail salons. The campaign asks the general public to spot the signs of slavery in nail bars and call the national Modern Slavery Helpline if they are concerned. Raising public awareness around slavery in nail bars is a crucial step in tackling this hidden crime. I strongly encourage consumers to remain vigilant to the signs of modern slavery, to ensure that perpetrators of human trafficking are exposed and victims are given the help and support they need. Do employees appear withdrawn or unwilling to engage? Do they appear younger than you’d expect? Are they avoiding eye contact, or is the presence or behaviour of another individual making them appear frightened? Can they speak English? Being unable to speak English can increase people’s vulnerability. You can report suspicions to the Modern Slavery Helpline on 08000 121 700.